Lampedusa has a population of around 5,000, living mainly off fishing, agriculture and tourism. Both Malta and Lampedusa belonged to the King of the Two Sicilies. The island of Lampedusa is synonymous with the landings of thousands of asylum seekers fleeing Africa. The landings on the Italian islet has often been the point of confrontation between the Italian and Maltese governments over who should assume responsibility for the migrants. I was recently reading a book, Essays On Governing Malta – 1800-1813 by Patrick Staines. He dedicates a chapter to Lampedusa which I found so fascinating. The following story recounts the time when that island was so dominated by Malta that all that remained for Lampedusa to form part of the Maltese Islands was the signing some readily available formalities. Lampedusa forms part of the province of Agrigento in Sicily. 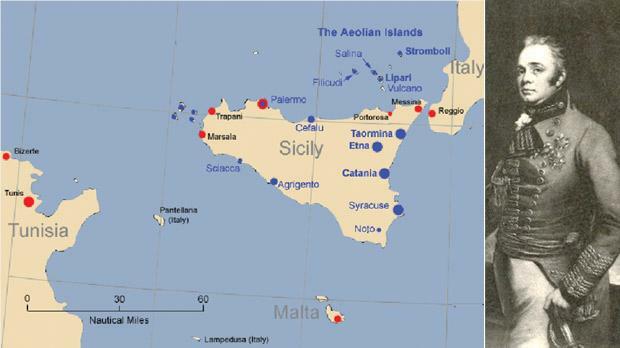 It is 205 km from Sicily and 176 km from Malta – that makes it some 30 km nearer to Malta than Sicily. The nearest mainland to Lampedusa is Tunisia, only 113 km away. 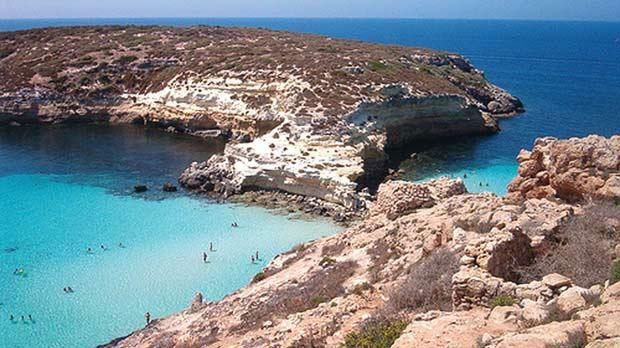 Lampedusa has an area of 21 square km, which is less than one-third of the size of Gozo. It lies to the south west of Malta and has a population of around 5,000, living mainly off fishing, agriculture and tourism. In the past both Malta and Lampedusa belonged to the King of the Two Sicilies. Lampedusa has no deep and safe harbour to speak of and being so close to North Africa was always prone to raids by pirates. It therefore remained largely uninhabited. The connection between Malta and Lampedusa saw its beginning in the late 18th century when the Prince of Lampedusa sub-let the island to a certain Salvatore Gatt, a Maltese entrepreneur. Gatt settled in Lampedusa with a few Maltese workers. They worked the land and collected as much firewood as they could carry in their boat and brought the lot to be sold in Malta. They were occasionally visited by Algerian or Moroccan corsairs – fortunately however only to buy food and fill up with water for which they would pay cash. Moreover, before leaving, the Maltese would leave oil to be burnt before the image of the Virgin Mary in the tiny chapel under the care of a chaplain. That was before the arrival of the French. That chaplain, identified as “F. Giovanni – ex-chaplain of Lampedusa” was listed among those planning to assault the Cottonera Lines during the insurrection of the Maltese against the French in 1798. Following the Maltese uprising and the blockade of the French in Grand Harbour, which resulted in the capitulation of the French to the British in 1800, the Malta-Lampedusa connection took another twist. The first strategy adopted by the British authorities was to consider Lampedusa as an alternative to Malta as a marine-military base in case Britain would have to vacate Malta, as stipulated in the Treaty of Amiens of 1802 with France. The idea was soon dropped as surveys of the island confirmed that Lampedusa is not remotely comparable to Malta on many counts, not least that it lacks any safe and deep sea harbour. When the Order of St John did not return to Malta as laid down in the Treaty of Amiens, the British could not abandon Malta and in due course they realised the island’s true value. With the British firmly established in Malta, the role of Lampedusa as an adjunct to Malta took an entirely different dimension. Correspondence between Malta and London on the subject, extant in the Malta National Archive and in the Public Record Office, London, show the Maltese government pleading with London to consider taking over Lampedusa. Their concern centred on the possibility that Sicily might fall into the hands of Bonaparte with the result that Malta would lose its main source of essential foodstuffs, mainly corn and meat. It was important therefore that the British government consider taking over Lampedusa, which, once in British hands, would be developed as a base for the provision of food for Malta. This, naturally, would have the added benefit of preventing it from being taken over by the French. 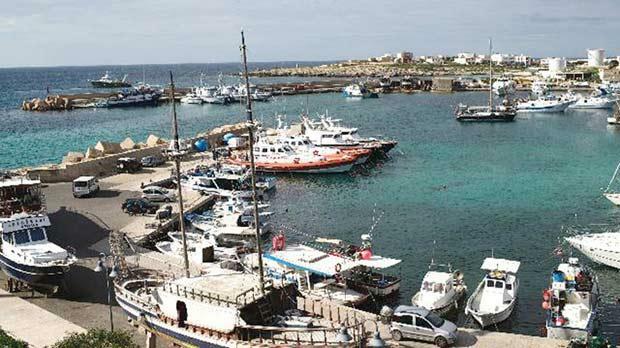 The British authorities in Malta argued that taking over Lampedusa should pose no problems as Salvatore Gatt, the Maltese leaseholder, was expected to co-operate. Likewise the Prince of Lampedusa, who held that island on feudal tenure from the Crown of Sicily and who had passed the perpetual lease to Gatt. The Prince would surely be receptive to a generous financial settlement. As for the King of Sicily, he was so indebted to the British government for its financial and military support during the recent war that he would surely pose no problems. As early as May, 1800, Alexander Fernandez, a British citizen and an employee with the Army Commissariat in the Mediterranean stationed in Malta, on instructions from the British Civil Commissioner of Malta, Sir Alexander Ball, drew up a report on the feasibility of Lampedusa forming part of the Maltese Islands. He reported that “a large open ranch could be established for the breeding and fattening of up to five thousand heads of cattle and from six to seven thousand sheep – an ample stock for Malta’s needs. Indeed, by 1803, a number of Maltese farmers had returned to Lampedusa, engaged by the Commissariat, presumably on a trial basis. It was reported that some “100 head of black cattle and 400 sheep are allowed to run wild... barley is successfully grown... olive trees are abundant and so is firewood”. However, the British government, in spite of all the reports and pressure from Malta, did not commit itself and preferred the waiting game. There were political as well as financial implications to be considered. In 1810 the lease of Lampedusa was transferred by Salvatore Gatt to Alexander Fernandez at 3,000 scudi per annum. Fernandez, acting on a personal basis, wanted to carry out his project of building a large farm for the breeding and fattening of cattle, to grow corn and other vegetables for the Maltese market. He calculated that between 80 and 100 Maltese hands would be required to run the farm. During sowing and harvesting additional hands would be hired from Gozo. A development on this scale however, required a measure of security. He requested military protection against hostile incursions which only the British government could provide. This time London reacted. In 1811, the Secretary of State, Lord Liverpool, instructed Governor Oakes to materially support the Fernandez project but insisted no families are to be allowed to settle on the island. However, in 1812 Liverpool appointed a Royal Commission to report on “Lampedusa, Pantelleria and Linosa as possible sources of supply of food for the Maltese Islands”. The resulting report was a blow to Fernandez. The commission considered his project purely as a business venture and wholly speculative. They could not recommend the government to “incur the heavy expense which would naturally attend the occupation of the island”. Problems for Fernandez accumulated rapidly. In May 1813, there was an outbreak of plague in Malta. The crew of HMS Partridge went down with yellow fever. The ship was directed to spend a period of quarantine in Lampedusa. On learning the true reason why one of HM ships was sent to their island, the inhabitants panicked and fled the island on two small boats, leaving behind a small number of farmhands. Over 120 inhabitants left the island – and like today’s boat people, they spent the next few days without food and water, plying the waters between Malta and Lampedusa, undecided whether to return to that island or to land in plague-ridden Malta. In early 1813, the King of the Two Sicilies informed the British government of his intention to let Lampedusa stay under British protection “at least during the war”. Indeed, the British flag was hoisted and a small detachment was posted there. But British interest to link the two islands was waning. Following the appointment of Sir Thomas Maitland as the new Governor of Malta, the matter came to a head. Fernandez was investigated as it was deemed not proper for an officer in HM Government service to become the sole proprietor of an island. And his pay was suspended. However, Fernandez was still the lease holder up to 1818. On March 1 of that year, he petitioned London for compensation amounting to £44,000 – a huge sum at the time – to cover losses incurred in the Lampedusa project which he considered as “a tale of official encouragement, official letdowns and eventually of sheer bad luck”. The petition was turned down. The final straw for Fernandez came when he lost the lease of Lampedusa by a decree of the Sicilian courts, at the instance of Salvatore Gatt, on the ground that he failed to pay Gatt the 3,000 scudi per annum he had contracted in 1810 for that lease. Gatt returned to live in Lampedusa with his family. He was still residing there up to 1824. In 1814 Maitland had closed the Malta-Lampedusa question by telling London that “it is my decided opinion that Lampedusa never can be of any real use or service to us; the sooner we withdraw the better”. In a Government Notice of September 15, 1814, the final withdrawal was announced as follows: “Public notice is hereby given that it is the intention of His Excellency the Governor to withdraw from the Island of Lampedusa the troops and stores now there, between the 25th of the present month and of the 1st of the next month, and that it is not the intention of this Government to have any further concern or connection with that Island”.